You spent last week participating in the festival of gluttony and gratitude know as Thanksgiving, followed that with the bacchanal of consumerism known as Black Friday, and now you're left with no money, tighter pants, and a bizarrely comprehensive knowledge of your uncle's political views. There's only one way to handle tough times like these: order pizza. It's cheap, it makes you feel good, and -- well, actually those two reasons are enough. 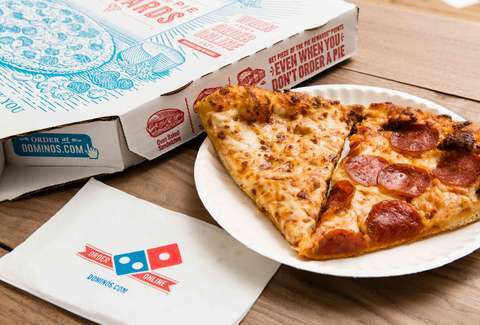 In fact, pizza is even cheaper this week because Domino's is offering 50% off all its pizzas until Sunday, December 2. All you have to do is order online. This is technically a Cyber Monday deal, but since it lasts all week and you're probably tired of hearing about Cyber Monday and Black Friday, let's just stick to the important part. You're gonna be eating for so cheap. Note that this deal only applies to "menu-priced pizzas" that are ordered through Domino's website or its app. But the discount is available nationwide, and ordering online means you won't have to expose the world to your weeklong food-and-shopping hangover. If you're under the (mistaken) impression that you can't live off pizza alone, check out these other Cyber Monday food deals.